James Franklin Powell was born in Fort Monroe, Virginia, in 1893. He graduated from Virginia Polytechnic Institute in 1916, and on October 26, 1917; was commissioned a second lieutenant in the Coast Artillery Corps of the Regular Army. General Powell served from October 1917, to September 1918, with the 15th Company Coast Defenses of Chesapeake Bay at Fort Monroe, Virginia, and as artillery observer in the Observers' School at Langley Field, Virginia, and Selfridge Field, Michigan. In September 1918, he was assigned as artillery observer of the 40th Squadron of the American Expeditionary Forces in France. In August 1919, he joined the 56th Coast Artillery at Fort Schuyler, N.Y., and served there and at Camp Jackson, South Carolina, as battery and company commander and regional athletic officer. On July 1, 1920, General Powell transferred to the Army Air Corps, and the following January was assigned to Ross Field, Calif., as police, prison, intelligence, and recruiting officer, later becoming a student at the Balloon School there. In March l922 he was assigned to the 321st Observation School at Portland, Oregon, serving concurrently as assistant in the office of the chief of staff of the 96th Division. He later served at Camp Lewis, Washington, as division air officer, and in September 1923, became a student at the Air Service Balloon and Airship School at Scott Field, Illinois. A year later he moved to Aberdeen Proving Ground, Maryland, as commanding officer of the 18th Airship Company. General Powell went to Luke Air Force Base, Hawaii, in August 1931, to command a squadron, and later served as post and group commanding officer of the 50th Composite Group. In June 1933, he assumed command of the 1670th Company of the Civilian Conservation Corps at Presque Isle, Maine, and in August 1933, moved to Chanute Air Force Base, Ill., as post adjutant and commanding officer of the 48th School squadron. In August 1934, he entered the Army Industrial College, and in September 1935, became a student at the primary flying school at Randolph Field, Texas. Upon completion of his studies there, he to the observation course at the advanced flying school at Kelly Fie1d, Texas, and in November 1936, was sent to Dayton, Ohio, as Air Corps procurement planning representative of the Cleveland District. In October 1939, General Powell became chief of the Materiel Planning and Statistical Sections of the Materiel Division, Army Headquarters where he remained until January 1942. He then was assigned to the Western Flying Training Command with which he later served at Santa Ana, Calif., as assistant chief of staff for materiel. In May 1944, he moved in that capacity to Fort Worth, Texas and a few months later went to Enid, Oklahoma, to command the 3lst Flying Training Wing. He subsequently commanded the 2502nd Base Unit at Perrin Field, Texas. In October 1944, he was assigned to the 2003rd Army Air Corps Base Unit at Fort Worth, Texas, where he served as senior deputy chief of staff, and subsequently chief of staff of the Air Corps training Command. personnel of the U.S. Air Forces in Europe, with station at Wiesbaden, Germany. In May 1949, General Powell was appointed commanding general of Keesler Air Force Base, Mississippi, and of the 3380th Technical Training Wing there. General Powell has been awarded the Legion of Merit with oak leaf cluster. He is rated a command p1lot, balloon pilot, combat observer, balloon observer and aircraft observer. 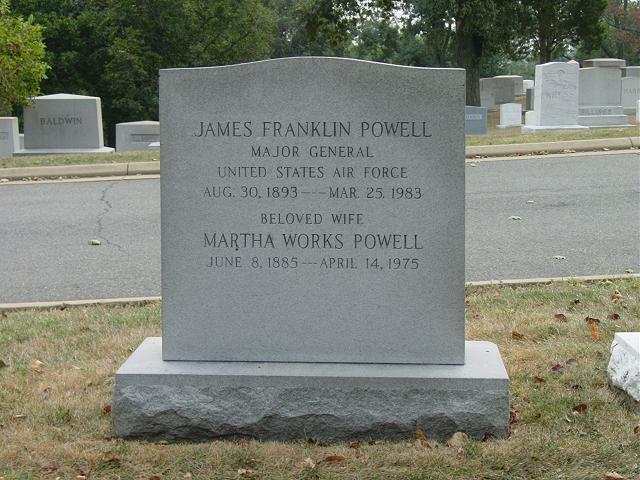 General Powell was buried with full military honors in Section 11 of Arlington National Cemetery.